The Pied egret or Pied heron (Egretta picata Gould, 1845) belongs to the order of the Pelecaniformes and to the family of the Ardeidae, group that includes birds endowed with long legs and very sharp and pronounced bills, strictly linked to the aquatic environments and practically present in every corner of our planet. Some species are very common and scattered in many continents, others, conversely, are sedentary and do move only inside these areas maintaining a particular and temporary anonymity till when some ornithologist discovers their presence. One of these species is rightly the pied heron and the date of classification done by Gould in 1845, almost a century after the work of cataloguing of the species by Linnaeus, is witness of its particularity. Already many years before, had passed over there, spending over three years from 1868 to 1771, onboard of the HMS Endeavour commanded by Capt. James Cook, the favourite disciple of Linnaeus, Dr. Daniel Solander, assigned there for collecting specimens to take to Sweden for the classification but probably this heron has escaped his attention. Since always classified in the genus Ardea it is now assigned by many to that of Egretta maintaining the past taxonomy as synonymous or vice versa, even if many support the old classification. 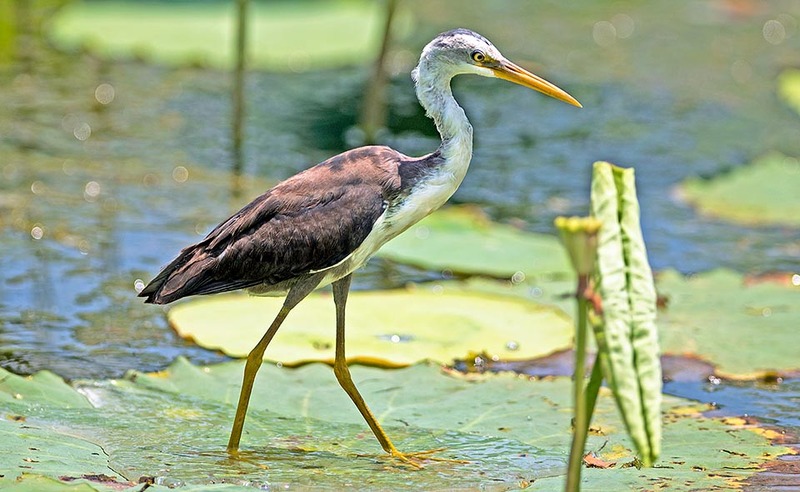 The etymology of the genus Ardea gets its origin from the Pre-Roman mythology and refers to the present city of Ardea in Lazio, by that time capital of the Rutuli, destroyed and totally burnt out during the hostilities with neighbouring populations. From its ashes revived a bird having the shape of a heron and of candid colour that was rightly called Ardea, like the city. By sure a direct reference to the legend of the Phoenix. The genus Egretta instead comes from the pampered form of the Provençal term “aigron” = heron to indicate a bird smaller than the consimilars and is probably coming in its turn from the German “heigir” later transcribed in Italian as “airone”, and in French as “aigron”. The specific name picata is a term of Latin origin that indicates a subject soiled by tar or pitch, hence white and black in the colour, so much that the same term has been used also for describing the Eurasian magpie (Pica pica), the Variable Wheater (Oenanthe picata) or the Wonga pigeon (Leucosarcia picata) all species displaying these contrasts in the colour. In Europe this bird, although not being directly known but result of scientific carryovers has been named recalling this characteristic of the livery. 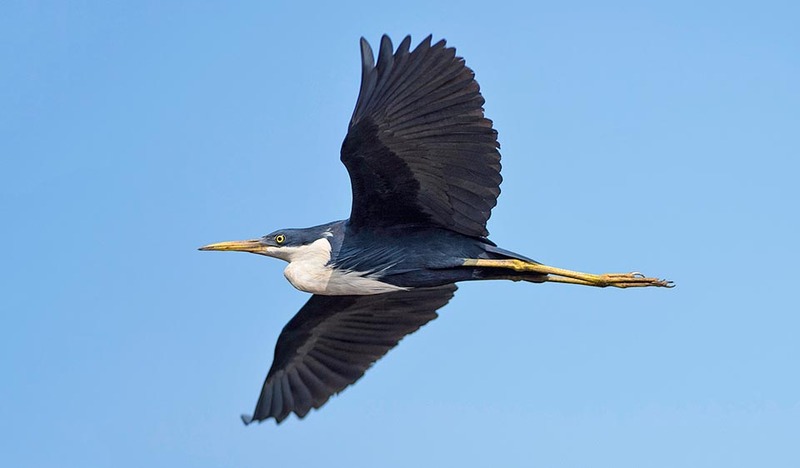 In English it is called Pied Heron; in German Elsterreiher; in Spanish Garceta Pía; in French Aigrette pie, in Portuguese Garça-alvinegra; in Italian Garzetta testa bianca or Airone bianconero; in Finnish a fanciful Valkokaulahaikaraed and in Japanese an unpronounceable Munajirokurosagi. 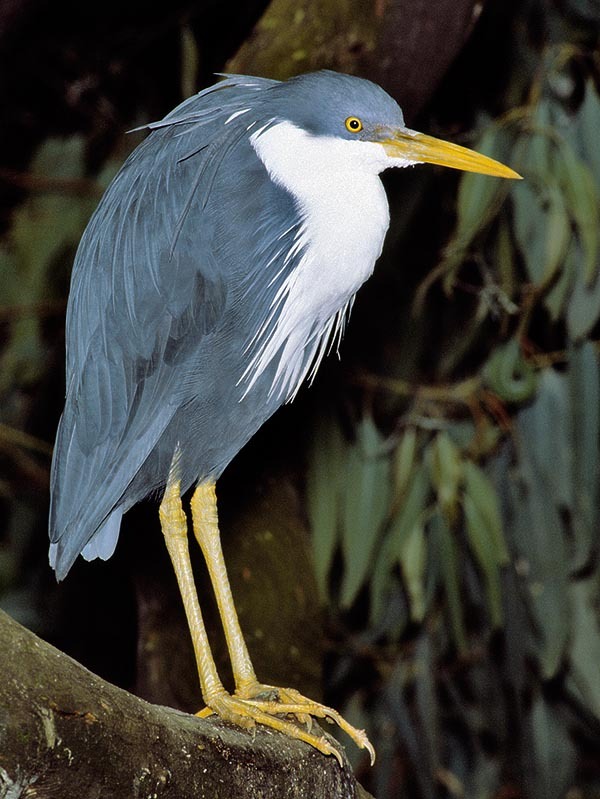 This heron occupies a rather reduced area as it is relegated to the northern coast of Australia, from Queensland on the east, to the region of Kimberley on the west, in the coastal zone of south-eastern New Guinea and separately with small populations, in the Aru Islands, in the eastern Maluku Islands and in the island of Sulawesi. Equatorial zones that grant this species the best conditions for a continuous sedentary lifestyle. As a matter of fact, the pied egret does not make any migration but limits to local seasonal displacements inside its territory, only for the research of swamps or flooded plains after the intense rain season. The limitation of its territory has not for the moment generated any classification of subspecies. Like all herons also the pied egret is strictly linked to the humid environments with presence of water, preferably slow flowing or stagnant. This heron frequents also small rivers or banks of large water streams but always prefers muddy bends or corners where it has the possibility of staying immersed mid-leg in the water with no difficulty. It frequents also the coastal forests of mangroves where it juggles with skill among the entanglement of the surfacing roots of these plants and also shores of lakes and of artificial reservoirs. Once the fishing is ended it loves to rest on low trees, hidden in the shade of the leaves of the branches facing the water surface. Like all herons it is rather solitary and hardly forms groups with specimens of the same species, preferring instead to cohabit with other birds not concurring in the search for food. The pied egret is a small ardeid that reaches the 50 cm of length, the 250 g of weight and a wingspan of about 1 m.
The livery is characterized by the contrast between the white and black colours that equally contend the plumage. In the nesting season the adults have the body totally black with metallic blue reflections, excepting the neck and the chest that are snowy white. The head has a black hood that starting from the line of the eyes covers perfectly the upper part of the head ending on the nape in a tuft of long and thin feathers that fall backwards. Feathers long even more than 20 cm that wave at the smallest gust of wind. Also on the chest, at the junctions of the long neck, are present white feathers also long and thin that fall on the thorax like a long fluttering gag. The trousers are black whilst the long legs are bare and of yellowish colour. 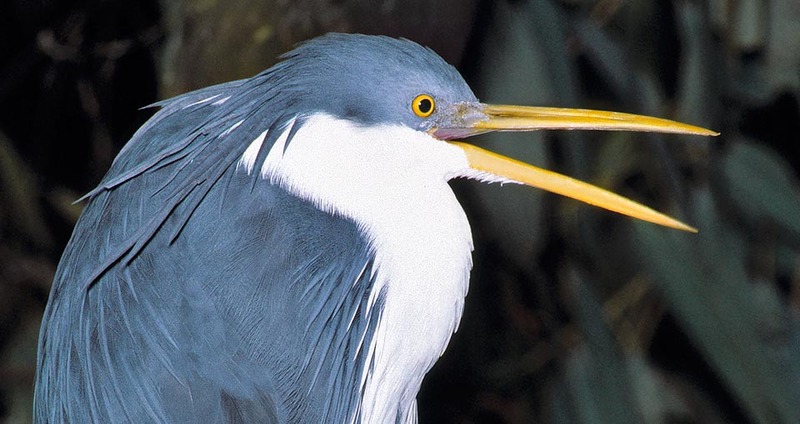 The eyes have the iris yellow indicating that, as is frequent in the ardeids, also this heron has crepuscular habits.The long and sharp bill is also yellow and slightly bent down in the terminal part. The reason that has led to the classification of this heron as “white head” is probably due to the fact that the young have really a completely white head together with the chest and the belly, contrary to the adults who have both black. The young have also a bricky covert that will be gradually replaced by the black once the maturity has come. At this stage of plumage the pied egret is easily mistakeable with the White-necked heron (Ardea pacifica) with whom shares most of the range and is so different from the adults that initially was classified as another species. There is no distinction between the sexes if not for a light difference of size in favour of the male. After a short courting, often close to the place where the nest will be built, based of flutterings, bows and guttural verses, a monogamous couple takes form and will last only for the nesting period. The pied egret nests usually on shrubs or trees or ramifications of mangroves well off the ground and often together with other species, creating heronries at times very populated. The nest is a little tidy platform formed by sprigs getting increasingly thinner to form a shapeless cup where will be laid 3 to 5 very pale green light blue eggs that later on, during the brooding, become of cream colour. Both partners will alternate in the brooding for 4 weeks and the small nestlings will stay in the nest for 40 days more even if they will begin precociously to go around, practically walking on the branches as if they were the bed of phragmites on which they will spend part of their adult life, taking advantage of the very long fingers like an enlarged support base. The independence occurs after 60-70 days more and the sexual maturity from the second year. This is the most delicate period of their life because falling to the ground not knowing how to fly would mean a certain death by the mouth of crocodiles, big snakes or terrestrial predators. The pied egret eats typically all what is linked to the aquatic environment. Amphibians and crustaceans, fishes and small aquatic mammals, insects and small snakes. Even if not very social outside the nesting period, it is often seen hunting together with other herons, in open spaces and without any fear. Actually, it is not a very timid species like some congeners that spend most of their time hidden in the reedbeds getting out with the darkness. It is not considered as an endangered species even if the populations are never consistent and the occupied territory is quite limited. Notophoyx aruensis Gould, 1845; Ardea picata Gould, 1845; Herodias picata Gould, 1845; Hydranassa picata Gould, 1845; Notophoyx flavirostris Sharpe, 1898; Tonophoyx aruensis normani Mathews, 1915.